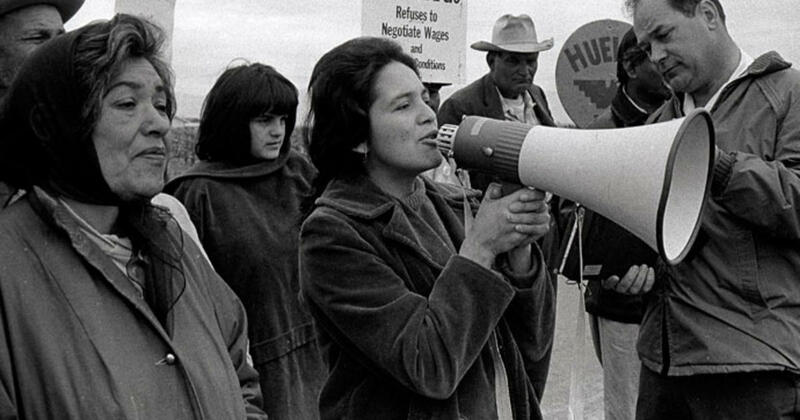 Whether one loves or loathes Dolores Huerta, the subject of the documentary Dolores, depends on one's ideological stand. Those on the Left will love her as this pioneering icon. Those on the Right will loath her as this pinko crackpot. The truth, I have found, almost always falls in the middle. Dolores is firmly on the love side, painting Huerta if not as a saint then as a passionate political advocate. Dolores is not critical of the subject. It also isn't all that enlightening either. Dolores Huerta saw the injustice that poor migrant workers were put through: low pay, no sanitation, no water for long, backbreaking labor. With that, she joined forces with another person concerned for migrants, Cesar Chavez. By the time she and Cesar united, Huerta had a long track record of political activism in Sacramento, the California state capital. It was a passion, one that took her away from her eventually eleven children and time to enjoy her beloved jazz music. She gave herself fully to 'La Causa' or 'The Cause'. It meant that she did not have creature comforts and that her children were in essence neglected. "The Movement became the most important child," one of her children remarks in Dolores. Huerta has little to no regrets about that. Her advocacy eventually did earn dividends, but there were other battles to fight. She soon saw that there was a need to unite her cause with the growing feminist movement of Gloria Steinem, even if at first she was the rare pro-life feminist until Steinem set her straight and Huerta adopted liberal orthodoxy on abortion despite her strong Catholicism. There was also the battle against the Teamsters, who were muscling out the United Farm Workers. There was her strong affiliation with Senator Robert F. Kennedy, including being beside him when he won the California primary on the night of his assassination. There was when she finally was forced to slow down her peripatetic life when she was beaten at an anti-George H.W. Bush rally in San Francisco. The worst or lowest point was when Chavez died in 1993. The leader of the UFWA had been the only leader many Mexican-Americans had known. Perhaps others expected Huerta to assume the presidency of the union, but she was not selected. Whether this was due to the fact that she was a woman or not we do not know. Leaving the organization that she not only established but that in a sense gave her her identity was extremely difficult, but Huerta is not one to be in a rocking chair and reminisce. She founded the Dolores Huerta Foundation and continues, at 87, to agitate for whatever she believes in. Dolores is an interesting story of a woman who defied many barriers, but it is not the whole picture. I would say that Dolores is not an exploration of who Huerta is but a celebration of what Huerta did and what she believes. There is nothing wrong with that, and even her detractors can draw many lessons about her life. Dolores shows the true power of the individual to affect change. It shows that gender and ethnicity are not impediments if one chooses not to be bound by them. However, part of me was frustrated that a lot of things were either papered over or ignored. For example, the Chicano movement may rightfully honor and respect Huerta, but the Chicano movement was extremely sexist, downright chauvinistic, in its attitudes about women. Despite what she said about her longtime companion, Cesar Chavez's brother Richard ("I wouldn't say Richard was a feminist, but he was a great cook"), the sense of Machismo still runs strong among many Mexican-American men. Dolores lightly touches on that when she says that she pushed to have more women involved, but despite that no female has taken on a major leadership role in the Chicano movement, at least not on Huerta's level. As a side note, Dolores made me wonder if there was a wide cultural difference between California Mexican-Americans such as Huerta, and Texas Mexican-Americans like myself. The experiences that shaped Huerta were not mine nor my family's, so despite being from the same ethnic group I think our worldviews are not the same. They may at certain points be similar, but not the same. Then there was when she was caught on audiotape saying "Republicans hate Latinos". That may be true, but I imagine many Latino Republicans would take umbrage at that. Dolores never allows for anything close to rebuttal or if memory serves correct, even expansion into why Huerta thinks that. That statement was a poor one, allowing her opponents to use it against her, but it is neither challenged or defended, something I found very curious. Dolores does touch on her private life with her children (not much on Richard, save for when people pointed out that she had 11 children by three men including one not her legal husband opened her up to accusations of adultery), but how she reconciled her Catholic faith with her support for abortion is not explored. It just is. Perhaps Catholics can separate the two: since I'm not Catholic I can't say. As another side note, perhaps because I am not Catholic, I again found it hard to cheer when she would say "Viva la Virgen de Guadalupe!" There were some wonderful moments in Dolores, such as when Steinem said that upon RFK's assassination, she had never seen 'the death of the future'. There were also moments of lightness: a party where Huerta boogied on down. These moments not only brought a touch of humanity to someone held as a living icon, but were moments that on a personal note, I could relate to. After all, Dolores could be one of my Tias ('aunts' to you gavachos). 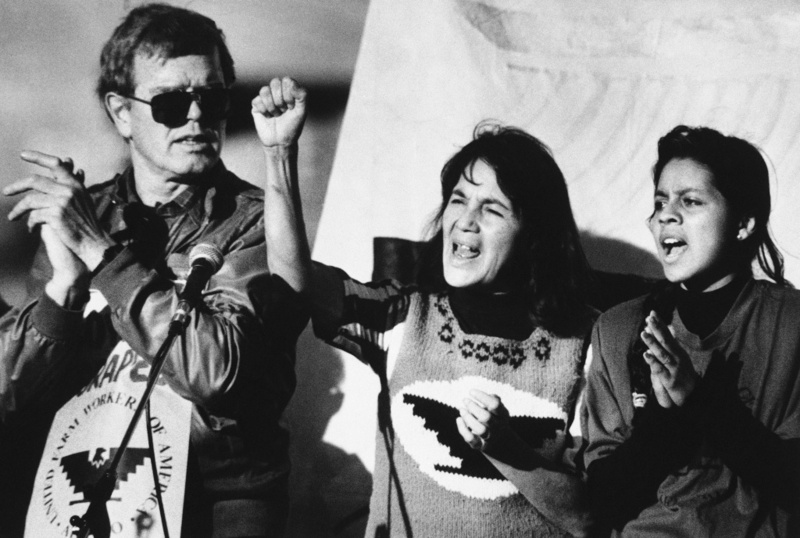 Let's be blunt: Dolores Huerta and I don't see the world the same (I, for example, was never With Her like Huerta was, even if Mama Hillary making a cameo in Dolores). I respect her, I admire her, but I don't always agree with her. Maybe one day she and I can have a chat over champurrado and mole. Dolores is a loving portrait of this firebrand, and not an analytical one. Again, if you love her, you'll love Dolores. If you hate her, you'll hate Dolores. For myself, I like her, would like to learn more, but doubt she'll win me over to her democratic socialist side.